I am a movement disorder and Parkinson’s disease (PD) nurse specialist. I work alongside specialist nurse colleagues, Patsy Cotton and Charlotte Casserley, in collaboration with ageing and complex medicine, neurology, neuropsychology and neuropsychiatric consultants and other members of the wider interdisciplinary team. I have a multi-faceted role that includes providing nurse-led clinics for people affected by PD and associated conditions. One clinic focuses specifically on those whose non-motor symptoms such as cognitive decline, psychosis or dementia are the predominant cause of their problems at that time. I coordinate the in-reach management service which provides a reliable, systematic approach to the assessment and management of patients with PD; this involves working in close collaboration with the wider multidisciplinary team. The team also has a non-urgent helpline in place to manage general queries. 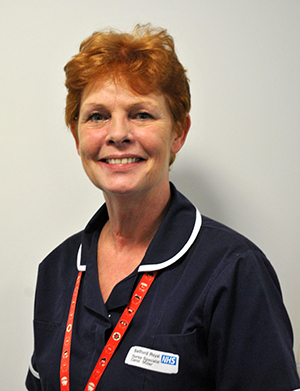 Why did you become a Parkinson’s nurse specialist? I was inspired by the way in which patients, families and carers coped with the complexities of this long-term neurological condition for which there is currently no cure. I was also fascinated by the diversity of the symptoms and methods of management in each individual. I trained as a general nurse at the Royal Oldham Hospital. My initial grounding in nursing people with PD was gained at Manchester Royal Infirmary, and I joined Salford Royal in 1999. In 2016, I successfully completed a 12-month Older Persons Fellowship for Nurses at King’s College London. I thoroughly enjoy the dynamics of the role and the enthusiasm shared by my fellow team members who have a mutual passion for providing excellent standards of care. You are part of the team that won a UK Parkinson’s Excellence Network Award for setting up an emergency admissions in-reach service for patients with Parkinson’s. What progress have you seen for patients since setting up the service? An increase in the proportion of patients seen by a PD specialist within 24 hours of admission. A fall in the number never seen by the PD team at any stage of their admission. An improvement in medication management. A fall in mortality rates in those with delirium. A fall in median length of stay by two days from medical beds after the introduction of the in-reach programme. The introduction of fluorescent yellow wrist bands worn by patients, imprinted with time critical medication. This visual prompt aims to reduce the incidence of omitted or late doses of medication. It alerts the nurses that medication must be given on time. Early feedback for the wristbands has been very encouraging. Seeing improvements in patient care as this service develops. What qualities do you think a Parkinson’s nurse specialist should possess? Self-motivation, outstanding communication skills, an empathetic nature and the ability and drive to continually develop clinical knowledge and skills. Always make sure your PD patients receive their medication on time, do not omit doses. Identify and manage delirium as a priority. What is likely to affect nurses working with people with Parkinson’s over the next 12 months? The incidence of older people with PD is increasing. Over time this will affect inpatient admissions, and social care requirements. Subsequently, there will be an increased dependence in palliative and end of life care needs.